Both cold and superficial heat can decrease the symptoms of musculoskeletal injuries and pain. The most general answer is use ice for acute (recent) injuries and heat for chronic (ongoing) injuries. So, heat or ice? To make the best decision, you need to understand what they can do. Applying ice to an injured muscle or joint can decrease swelling, pain and irritation associated with a new injury, for example: if you just sprained your ankle or had knee surgery, then ice is your best option. Ice causes your vessels to constrict, which limits blood flow and decreases swelling. The cold can numb the affected area, lowering pain. Of course, icing a joint may make it feel stiffer and less mobile. Ice is best applied for 15 to 20 minutes at a time and no more than once per hour. Icing for more than 20 minutes can cause blood vessels to spasm between constriction and dilation and increase pain levels. If there is significant swelling, it is beneficial to elevate the affected body part above your heart. For example, if your knee is swollen, lie down, prop your leg on pillows and apply ice. Heat is your best option for more chronic injuries, in which there is no swelling. For example, chronic back or neck pain may respond best to a hot pack. The use of heat can decrease your pain and increase your mobility. Heat decreases the pain in an area, which allows for more pain-free movement. The most obvious one is leaving it on too long or the temperature being too hot, both potentially causing a burn. Caution should be paid to having enough layers between the hot pack and the skin to prevent burns. Electric hot packs without a timer are cautioned because of the risk that you could fall asleep and get burned because of prolonged exposure. Hot packs should not be used for acute injuries for risk of increased swelling. 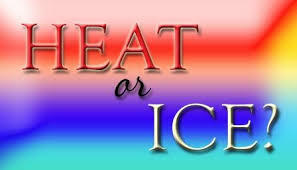 In summary, ice and heat are good options to manage the pain and swelling that occurs with musculoskeletal conditions. Both modalities have minimal side effects and are easily accessible when dealing with pain. With the knowledge of how ice and heat affect your body, the best option could come down to what feels best for your injury.